Guadalupe Gardens is located south of the Mineta San Jose International Airport (and adjacent to the river park) where homes were removed because of noise 20 years ago. The master plan for this area was developed by the City of San Jose and a Citizen’s Task Force. The empty land that makes up much of this area will one day be transformed into all sorts of gardens for the public to enjoy. Guadalupe River Park Conservancy is currently in the process of updating the existing Master Plan for Guadalupe Gardens. The process will result in detailed design guidelines and a strategy for implementing new garden elements. 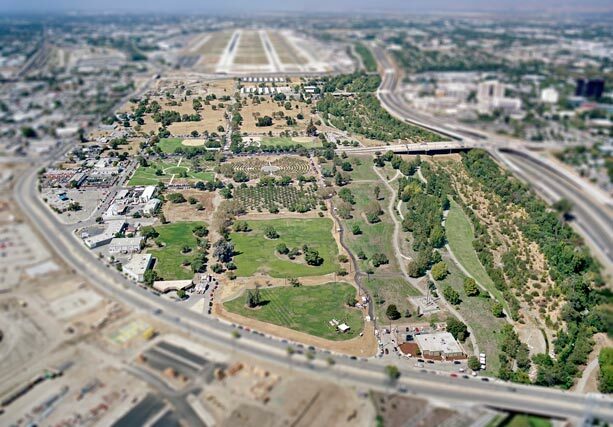 Guadalupe River Park Conservancy and Board members, Master Plan Committee members, and staff were instrumental in developing the Master Plan for Guadalupe Gardens that was approved by the FAA and adopted by the San Jose City Council in 2002. That plan called for development of the Gardens in phases, and much of the first phase is now completed. In approaching the next phase of development, the Conservancy and other members of the Guadalupe Gardens Technical Committee (composed of City staff from Parks, Recreation & Neighborhood Services, Airport, Department of Transportation, and San Jose Redevelopment Agency) concluded that more detailed design guidelines and a clearer strategy for implementation were needed, especially due to the incremental implementation of the Plan. The Friends applied for, and received, city funding to manage the planning process. The Friends’ Master Plan Committee, chaired by Board member and landscape Architect Derek McKee in 2007, and Board member and planner Jodi Starbird in 2008, is providing oversight and direction to the planning process. The Friends hired the firm of RHAA (Royston, Hanamoto, Alley & Abby) to explore various concepts for the site, draft the written guidelines, and facilitate the process of integrating many ideas into one cohesive plan. A community meeting in early November solicited public input on the proposed master plan revisions, including the location of a possible future dog park. The Guadalupe Gardens Technical Committee is providing review and oversight and will direct the City process for approving the final Master Plan amendment. Two community meetings (in November 2007 and February 2008) were held as part of the planning process. The first meeting consisted of a presentation by the consultant team on the opportunities and constraints of the Guadalupe Gardens site and history on development of the existing master plan. They then facilitated the flow of ideas, concerns, and questions voiced by the audience. Approximately 45 people, representing neighbors, members of the Guadalupe River Park Conservancy, and city staff were in attendance. Please take a look at the agenda and minutes from the meeting, below, as well at the consultant’s display boards. Following the community meeting in early November, the project team met to review and evaluate the public input and provide further direction to the consultant team. The consultants’ scope of work includes integrating the priorities of the city, the Friends, and the community and ensuring that all proposed land uses are compatible with FAA regulations. This is essential since Guadalupe Gardens is located in the immediate approach zone of the Mineta San Jose International Airport and the city purchased the site with FAA grant funds. A draft of the design guidelines and implementation strategy report was completed in mid-January. The draft was reviewed by the Friends and the Guadalupe Gardens Technical Committee and presented at a second community meeting on February 13. The plan was very well received by those in attendance. Additional comments and suggestions were made and will be considered in the final draft report. Please see the agenda and minutes form the February 13 community meeting below. These plans are pending approval by several agencies, including the City of San Jose. This plan was approved by all relevant agencies in April 2002. This plan was never approved.